You know that making a good haircut work is about finding the right style and balance for your customer’s hair color, hair type, face shape, and skin tone. Believe it or not, making your resume work is similar. It’s important to know exactly what works and what doesn’t when striking the right tone and visual aesthetic if you want to stand out in the job market without making a negative impression. With an optimized resume created using our hair stylist resume templates, you stand a better chance of making the cut. Let’s take a look at just why resume templates work, and how you can apply resume writing best practices to tailor our style to your needs. 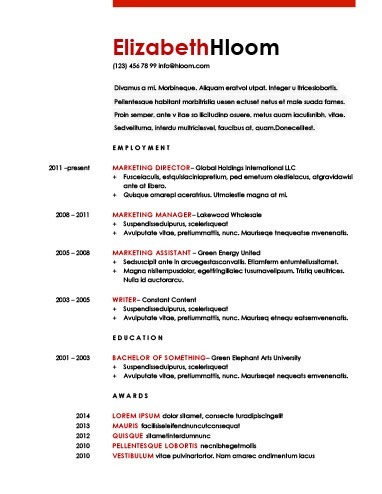 Why Use Hair Stylist Resume Templates? You’ve probably heard the myth that resume templates are a bad idea because they’re obvious and look cookie-cutter and generic. That couldn’t be less true. Yes, a bad template will stand out like a sore thumb, but good hair stylist resume templates let you personalize and customize until you have an impressive document that’s unique to you. Using a template provides you with a number of benefits as long as you’re smart about it. It’s like using a reference photograph or color swatches when cutting and dyeing hair. Shortcuts improve the process, rather than reducing quality. There are a number of ways shortcuts can optimize your resume writing process. If you’re not sure of the best order in which to present your experience, try our chronological hair stylist resume templates. Chronological is the most popular resume format, and it lists your work history in reverse order from most recent to oldest. Using a chronological format, you can easily show your progression and career growth on a simple timeline. A tried and true veteran, you’ve built a long history of accomplishments at reputable establishments. You may need more room to tout those accomplishments, so your best bet is to use our two-page hair stylist resume templates. For more senior candidates, these templates provide room to expand on skills and extensive work history without crowding a one-page format. If you’re starting off with internships to get experience under your belt before claiming a chair in a salon, internship hair stylist resume templates can help you draw attention to the information needed to get the role. For an internship, you focus more on skills than experience and use your education to your advantage. Use a template to see the best way to make a strong case for yourself. You’ve probably got a distinctive, fresh style. Your resume should reflect that with a cutting-edge look, and you can find inspiration in our modern hair stylist resume templates. Modern resumes focus on a clean look and stylish use of fonts and color accents to make you stand out as a professional with a touch of creative flair. Some salons look for styles that are more upscale and understated. If you’re targeting a more high-end, conservative establishment, you may want to try our professional hair stylist resume templates. A traditional resume with a more refined, elegant look can present you as someone reliable and tasteful with a clean, understated aesthetic and excellent organizational skills. Our hair stylist resume templates are just the beginning. To make your resume really work for your job search, you need outstanding content that trims unnecessary information and brings out your career accomplishments. Name: Don’t be cagey about providing your name or trying to use nicknames. Employers may see this as an attempt to hide your identity. Use your full legal name. Phone Number: Make sure your phone number is correct. Missed chances happen when you list incorrect contact information. Email Address: If your email address doesn’t use some professional variant of your name, create a new one. Your email should reflect your professional image. Address: Use your home address. If you aren’t comfortable providing a street name and number, at least mention your city. Summary statement: Employers want to know what you can do for them. Don’t be afraid to tell them with a summary statement that provides your personal sales pitch in three sentences or less. Objective statement: While quickly falling out of popularity, objective statements still have limited use for new graduates. Use an objective statement to discuss how you’d like to see your career grow with your first employer. Searchable: The most important thing about your skills section is that it should be searchable by both humans and machines. Use keywords and phrases taken from target job listings. Simple: Don’t go overboard with full sentences or descriptors. Keep it to between four and six short, punchy phrases. Action-oriented: Use action-oriented writing to brighten up your work history with vibrant phrases and strong verbs. Convey a sense of involvement and investment. Bullet-listed: Keep your experience succinct, confined to only six to eight bullet points per job listing. Try to keep each bullet point to one sentence alone. Blast from the past: Your work history should only cover the last 10-15 years. Anything else is obsolete and takes up unnecessary space. Stay on point: Don’t include education that doesn’t match your target job. If you’re a hair stylist, your welding certification isn’t relevant. Don’t forget training: Degrees are important, but so is relevant training. Don’t forget to add your courses and certifications. If you’re short on time or not sure what the best look is for your resume, try our resume builder. Not only does it walk you through the process of creating a resume, but it also uses personalized information to match you to the best of our hair stylist resume templates. Start off a step ahead of the competition with a tool that helps you optimize your career presentation. • Helps you contextualize your past experience in the best way. • Provides stylish, attractive options for format, font, and color. • Applies resume best practices to improve your writing. • Recommends personalized options to make our templates yours. Kick off your career in style with a resume template that brings out your best attributes and makes them shine.